This Weld Pin is an excellent choice for those applications that require a pin that will perform the function of a bearing surface, hinge pin, stop pin, or mounting pin. It features three precision weld projections that work to ensure a strong and reliable weld. This weld pin will also work well in concealed and/or blind applications. 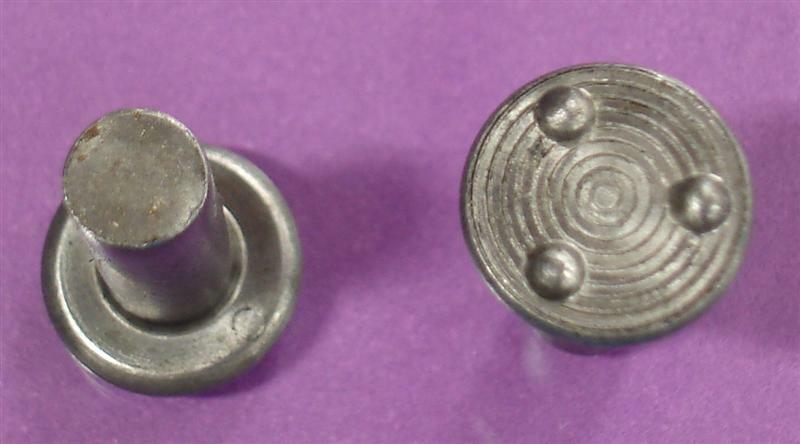 These industrial fasteners are available from JHP Fasteners in a variety of materials and dimensions (inch and metric). Note: A variety of other dimensional characteristics also available. This weld pin can be spot welded using standard spot welding equipment. No special tooling or fixturing is required. This weld pin is ideally suited for use within concealed or blind applications. This pin requires no mounting hole, thereby improving the appearance and durability of the finished product. For applications that require a robust weld pin that can be used within concealed or blind applications, without the necessity of a mounting hole, this spot weld pin is an excellent choice. Its robust design characteristics make it a good choice for those applications that require a pin that will serve as a bearing surface, hinge pin, stop pin, or mounting pin. JHP Fasteners has 40 years of experience in the industrial fastener business. We carry a full suite of industrial fastener products and pride ourselves on our ability to stay abreast of all industry trends and developments. We take pride in our commitment to complete customer satisfaction. Contact JHP Today… Contact us for more information on our top of the head three projection weld pins, or for any additional industrial fastener requirement you may have.